We’ve all had “those days” where it seems like there are a million urgent strings pulling on you. Your spouse forgot their wallet so you have to drop everything and take it to the office. Somehow a bill slipped through the cracks and you have to spend 45 minutes on the phone with the cable company. A coworker at your J-O-B got sick so you have to fill in for her at the last minute. Oh, and let’s not forget about the email trap: questions coming in from others who need your guidance, small details on projects that must be taken care of, etc. Yes, we’ve all been there – and of course, those things are important to take care of. But what if you spent all day, every day at the whim of those minute, “urgent” tasks? Stephen Covey, author of The Seven Habits of Highly Effective People, presents an important idea that, if implemented, can make a big difference in your success as an artist: the Time Management Matrix. Covey breaks up tasks into four quadrants: Important and Urgent, Important but not Urgent, Unimportant and Urgent, Unimportant and Not Urgent. He stresses that many of us get caught daily in a cycle of putting out fires. “Firefighting,” as he calls it, falls into the Important and Urgent category and includes submitting to breakdowns that are time sensitive, preparing sides before you see the CD, and getting your shifts covered at work so you can go to your next audition. And yeah – you can’t ignore those things! But when they make up most of your day-to-day, how can you plan for the future? The second quadrant is key to sustained success. These are activities that are Important but not Urgent, and they often fall by the wayside in our fast-paced lives. These are things like attending casting director workshops, networking with local filmmakers, or writing the script that you’ve been putting off. Oh yes, and let’s not forget the task of taking care of yourself! Exercise, cooking healthy food, and strengthening your acting muscles in class also fall into Quadrant 2. 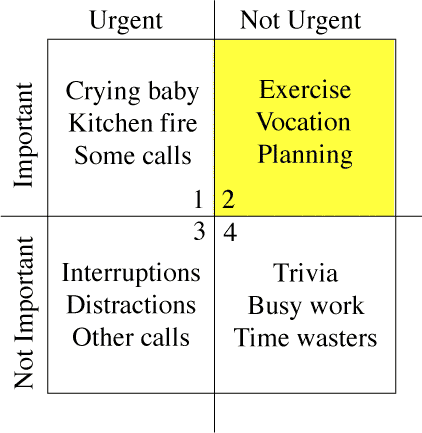 Quadrants 3 and 4 both fall into the “not important” category and Covey generally qualifies them as distractions and time wasters (hello, trolling through my Facebook feed... eek!). Since I’ve become aware of the Time Management Matrix, I’ve really shifted my workdays. Instead of waking up and jumping to check my email (which is usually comprised of Quadrant 3 issues [distraction] or Quadrant 4 issues [time wasters]), I take some time to myself to plan. Maybe I’ll take a yoga class, do a little financial planning, or start pulling together my most recent footage so I can update my reel. After 90 minutes of time spent working on Quadrant 2 activities, you can see how my life is much more enriched than if I had spent the time checking to see who tagged me in a post on Facebook or answering emails that could have waited until the afternoon. Quadrant 2 time is so vital because it’s when you craft your vision for the future, and figure out how you’ll take steps to achieve your goals. Rather than feeling harried all day, it’s about consciously setting priorities and taking care of them. So, take a look at your day and how it’s planned. Are you allowing yourself to be at the mercy of unimportant activities, or do you set aside time for Important but not Urgent tasks that will ultimately move your career forward more productively? I’d love to hear about your progress. Leave a note in the comments area below to joint the conversation! And if you’d like a little guidance in crafting your week to maximize productivity, click HERE to connect with me directly.